Price is 38% below the initial Lego retail price, a € 34.53 discount! This comes down to 6.44 cent per brick. 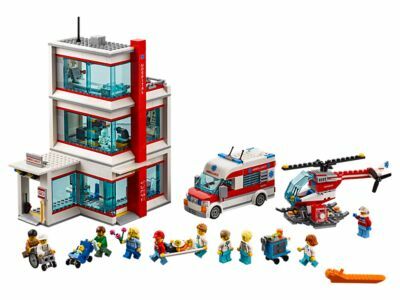 The LEGO® City Hospital (60204) Lego set is available from the sites below. However, they do not offer delivery to your selected region. The LEGO® City Hospital (60204) Lego set is no longer directly available from the sites below. However, 3rd party partners of these sites might still have the set available. Alternate description Join the heroes at the LEGO® City Hospital! Includes 11 LEGO® minifigures: 3 doctors, a hospital worker, 2 paramedics, mom, dad and 3 patients, plus skeleton and baby figures. Features a modular, 3-level hospital building with reception area, kiosk and ambulance drop-off, vision testing room with eye chart, x-ray room with light brick function, plus an operating/delivery room and a helipad. Also includes an ambulance with opening back door and room for a stretcher, plus a helicopter with spinning rotors and storage box. Configure the hospital modules to create your own unique hospital design! Spin the rotors on the helicopter to transport needed medical supplies in the storage box. Lift the back of the ambulance to unload the minifigure patient on the stretcher. Flip the switch to trigger the light brick and take an x-ray. Accessory elements include a stretcher, stroller, flowers, head bandage, baby bottle, baby bed, rolling shelves, scissors, syringe, needle, 2 cupcakes and 3 bottles, plus a buildable wheelchair. Hospital measures over 10” (26cm) high, 8” (21cm) wide and 5” (14cm) deep. Helipad measures over 3” (8cm) wide and 3” (8cm) deep. Helicopter fuselage measures over 3” (8cm) high, 6” (16cm) long and 3” (9cm) wide. Ambulance measures over 3” (9cm) high, 5” (14cm) long and 2” (7cm) wide.